Hashtag Bourbon– Bourbon Lane Stable’s Hashtag Bourbon was a maiden going into the $100,000 Mountaineer Juvenile Stakes on August 2 but came back a stakes winner, charging from behind on the turn, taking command in the lane and pulling away to a 4-1/2 length victory over fellow OBS graduate Gotta Get Paid (August ’13). 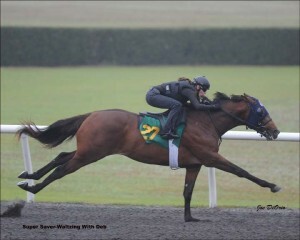 After a first and a third from two starts, the 2-year-old colt by Super Saver has earned $66,000 to date. He was sold by Secure Investments, Agent for $130,000 to McMahon and Hill Bloodstock, Agent, at the 2014 OBS March Sale after breezing an eighth in :10 2/5 at the Under Tack Show.